We shall see, today, whether Jose de Venecia Jr. has been able to rattle enough congressmen to give impeachment a second wind, or whether the Palace’s intention to kill it comes to pass (the funeral rites will have to wait for a plenary vote). Make no mistake: the killing of the impeachment was supposed to be preordained from the start. It was supposed to have been completed last week. It has to be killed by midweek, this week. Today, the House truly has a three-ring circus going (and why no complaints from the usual Senate-as-circus bashers, eh? ): the Justice Committee hearing on impeachment; a hearing on Constitutional Change (you know my views on this being helpful as a smokescreen, besides it’s being a Palace priority, anyway); and a Bolante hearing. The only reason impeachment is still part of the circus is that there have been some wrinkles in the scheduling (and I think we intervenors can take at least a day or two’s credit for helping achieve this), because of the reorganization of the Senate, the publication of former Speaker de Venecia’s book, he and his son’s decision to come out swinging more than they did previously, and so on. The Palace and its ruling coalition never leave anything to chance; and they know, too, that every government since 1986 that has fallen has done so, less because of its long-standing opponents, but more from the destabilization caused by its own allies bolting the administration of the day. Among the former close friends turned outright enemies if not uneasy and rather disgruntled allies, are a bunch of people with quite a resume when it comes to bringing down governments: never mind Cory Aquino, who on her own, without Cardinal Sin, has been, at worst, a living reproach to the President. Think Fidel V. Ramos, and Juan Ponce Enrile. 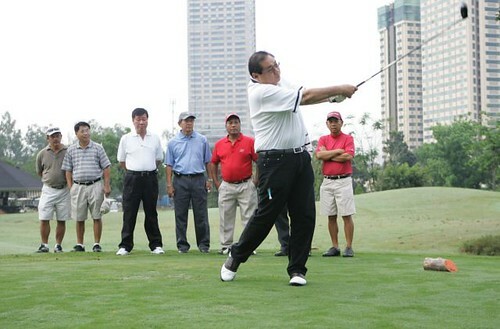 Why, consider, even, Eduardo Cojuangco, Jr., who, together with Enrile and Ramos were part of the “Rolex 12” who helped plan martial law in 1971-72. Which is not to say the oldies but baddies trust each other, but they are old pros and can reasonably cooperate with each other; but FVR is said to have told JDV, to show tangible signs of not only meaning business, but having a tangible effect on the dynamics of the House. 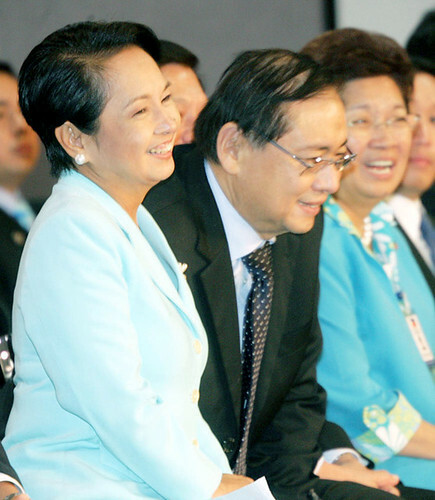 If JDV could rock the boat enough, then the other elders could move and provoke a party split, as a prelude to swinging the votes necessary for an impeachment -or even a cabinet coup, declaring the President incapacitated, which she would challenge and which would then have to be put to a vote in Congress. Among the ex-Speaker’s supposed big bombs: testifying that he had personal knowledge of the Batasan being broken into, and election documents stolen, thus nullifying both Congress’ proclamation of the President and Vice-President in 2004, as well as the Supreme Court’s declaration of the authenticity of that proclamation, based on the official documents kept in the burgled ballot boxes in the Batasan (see SAF commandos confirm 2004 poll fraud coverup and Complicity in poll fraud coverup taints SAF record ). This is a bomb that might have delivered the presidency to Villar, making him Acting President and a powerful incumbent. Enrile’s election as Senate President means Villar is down, but not out, he can still be supported by the elders in 2010, but another elder with wide experience in bringing down governments, can be enticed with the glittering prospect of crowning his career, not just as Senate President, but as President of the Philippines. And the other presidential wannabees might just risk it, too. A scenario that requires nerves, to be sure, and which furthermore brings to the same table four figures with their own bases of military support: Ramos, Enrile, Lacson (as part of the new Senate majority) and Cojuangco, whose nephew,after all, is Secretary of National Defense and has, together with his uncle, carefully cultivated generals all the way back to the Marcos years. And lots of money, and a little luck. But one that offers the comforting prospect of a predictable, fairly safe, elimination of the President and a chance for the ruling coalition to remain pretty much intact, meaning those enjoying the perks can continue enjoying those perks in a new government, and one which can claim it saved the Republic from both the President and the parts of the opposition they don’t like or can’t deal with. Now there’s supposed to be a reason behind the President’s husband suddenly coming home, which is that the Palace has gotten a little nervous over all these plots and sub-plots (and it is always sniffing out plots, real or imagined), that it was beginning to wonder if the loyalty of the ruling coalition was fraying a the edges, and that it had better have someone minding the family store if JDV starts going berserk. One source of nervousness is the possibility that the financial resources of the powers-that-be aren’t what they used to, between the losses of $100 million by the DBP or $800 million by the GSIS, and who knows, what if personal portfolios ended up evaporating in the financial meltdown, too? Besides which, even if the piggy bank’s still stuffed to the gills, someone has to make sure the “bon bons,” as the euphemism du jour puts it, these days, reaches the intended recipients. And if there’s one tradition as deeply entrenched as the Opposition revival of impeachment year after year, it’s the ruling coalitions expectation of bon bons for quashing impeachment and for Charter Change, besides. So it was interesting to see the President’s husband shuffle out of St. Luke’s, flanked by his sons, when he could very well have been whisked away. This was obviously a calculated move to reassure friends and foes alike, that the President’s main operator is present and accounted for, aided by his two sons, who have grown into the job of being junior operators, too. And it was equally interesting to see that even as JDV rambled on in the Committee on Justice, his colleagues slipped away -to consult? Be reassured? Extort? All of the above? We shall see, today. Last night, Matias Defensor on Ricky Carandang’s show tried to sound balanced but gave the impression he was inclined to discount the former Speaker’s testimony. The ruling coalition, then, seems to be holding together. And why not? While FVR, JDV, Cojuangco, and Enrile might be an Old Boys Club inclined to get along, the idea of a President Juan Ponce Enrile -even in a temporary, acting, capacity- should be enough to give even the most jaded of legislators the creeps. Still, there you have it, what has been talked about, for some time now. I understand that even people in the government’s own network have taken to freely exchanging scuttlebutt on a potential Enrile assumption of the presidency. Which only goes to show their lack of affection for their boss. Still, if the President and her husband show any signs of running out of bon bons to hand out to their coalition supporters, then anything is possible. But first things first. Just dispense with impeachment as a matter of necessary housekeeping that’s already gotten untidier than it was ever supposed to. Then refocus on what had to be brought forward a bit to act as smokescreen to try to deflect de Venecia’s own sense of timing: Charter Change. Whatever’s afoot, it’s still important to keep an eye on the President’s husband, and whether he will once more recede from the scene or become more visible as part of the Palace being on a war footing. While there have been many reports on the behind-the-scenes role Atty. Arroyo plays in the administration (see Did Mike Arroyo fund postelection ‘special operations’ in Lanao? in the PCIJ blog), his own statements for posterity leave little room for speculating as to what he does and is capable of doing. In the 1960’s, Nick Joaquin, writing as Quijano de Manila in the old Philippines Free Press, wrote a piece titled “The Battle of the Books”, about the propaganda battle between Diosdado Macapagal and Ferdinand E. Marcos, waged in part by means of their authorized biographies. It’s one of those ironies of history that Jose de Venecia, Jr. has weighed in with his authorized biography while another, penned by Joaquin, already sits on the shelves. 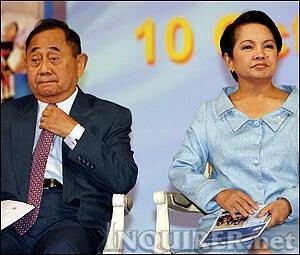 That authorized biography is Madame Excelsis: Historying Gloria Macapagal-Arroyo by Nick Joaquin, published in 2002 by Philippines, Inc. and Strategic Advantage, Inc. (the “Project Principals” co-chaired by Donald Dee, Luis P. Lorenzo, Jr. and Sergio R. Ortiz-Luis, Jr.). I’d like to reproduce some extracts from the book, which has the President’s husband explaining his own role, as he and his wife saw it, in her assuming the presidency in 2001. The first extract has something to do with a problem I discussed previously in my entry Numerology and politics: it is wrong to think that everyone -or actually, anyone- acts truly rationally, not only because of emotions, but because the Supernatural is something these players factor into their actions. Take for example one of the odder reasons given for that curious midnight Mass the President held in the Palace: that it had something to do with feng shui. Aside from listening to visionary nuns,and periodically having priests exorcise the presidential palace, the President or at least her people, do believe in feng shui and it seems to me likely, based on the published recollections of the President’s own husband, that the couple don’t think feng shui hurts, either. The very next Sunday, November 11, the Iglesia ni Cristo and Mike Velarde’s El Shaddai assembled a million people on the Luneta in a prayer rally that was really a manifestation of Erap as Lord of the Masses. Lord Erap had espied the error of the opposition: It wanted him out but were in violent disagreement on: what next? There was no consensus yet on just letting the Constitution prevail, with Veep Gloria taking over should President Erap be ousted. Unhappily there was a contrary tenet that Gloria should be bypassed because she had collaborated with the corrupt Erap government. Rene Corona, in those days a Gloria monitor (and afterwards her Malacañang spokesman), insists that prevalent then was the preference for the succession prescribed by the Charter. This may have cost her the hearts of those who believed that Erap could not be dislodged without violence, chief of whom was the Enrile group proposing to field a combined civilian-military force. Rene Corona opined that where this group erred was in so airily assuming that Gloria and the Constitution could be so lightly bypassed. However, this second People Power epiphany was not unformly the tea party that Mao said no uprising could be. For a while, again and again, it looked as if bloof would have to be shed. And Mike Arroyo says they were ready to shed it. And on real war. A hot war to empty EDSA, divide the nation, ands keep him in MalacaÃƒÂ±ang. All he needed was time: time to get the hot war started and startling. And so Erap’s endgame was delay, delay -delay discussions, delay agreements, delay decisions. But Mike Arroyo says they were prepared for that, too. And those who taunted the peaceful “mob” at EDSA to go ahead and make revolution -with scissors and bolos and kitchen knives- didn’t know how close they came to being killed in a not so gentle show of People Power. If Erap was banking on a hot war, so were certain troops of Gloria’s, including Mike Arroyo’s forces. Superstition maybe, but all the signs, as Mike Arroyo read them, pointed to the room at the top for Gloria. Mike Arroyo would marvel how people who sneered that Gloria was too greedy and impatient for the presidency would later, when Gloria the President consulted with this or that people’s group, would very snidely sneer that the consultations proved that Gloria had not been preparing for the presidency. Mike Arroyo admits he had his moments of doubt. Arroyo says he and Chavit Singson had what they called Plan B, involving elements of the military eager to strike the first blow against the Erap regime. Even so the military involved were for going on with the plan: “Boss, let’s go ahead and make the strike!” But Mike Arroyo knew that other moves were afoot. So if you live by the plot, you can die by the plot -hence the need to be constantly ruthlessly stamping out plots against you. How the key players act today and over the next week or two, will bear watching. I can only say one thing about the elders’ (Ramos, JDV, Enrile, and Cojuangco) plot. Incredible but plausible. In many instances in the Philippine setting, the dynamics of conspiracy are not planned but instantenous. Pinoy pa. Do I hear Balimbing? at this point i can only guess that those tongressmen are also very calculating and ever looking and sniffing if sticking it out with arroyos will be beneficial to their careers/wallets. if they smell that the money well is drying up, rest assured they will turn against their present benefactor to save their own hides. So discuss why it cannot be de Castro and they have to go all the way to Enrile? the committee vote is nothing. Truly amazing this country. There you have it, the head of the Batasan then JDV with the head of the executive Big Mike and GMA cavorting with a foreign supplier to the government in the foreign country. Yet we want to take sides on who is the crook. For JDV resign your position and swear never to take a public position for your sin. The same goes for your entire family and most especially your son and your present wife. You want to change this country take the tough road to Damascus. The value system here based on family interests first stink to the high heavens. There is no such thing as national interest in this God forsaken land. There is no God in this country. For that you can thank the majority of those men still in cassocks. If JDV wants to start his moral revolution he should start with himself and his family. Ideas move mountains. No one in the political structure has come up yet…. Events will create the man. He could be evil or good. But it will happen. The value of wealth destruction ongoing in the world today is unprecedented. The ultimate in state intervention in the U.S. is happening. Nationalization and Internationalization of the dollar. The plutocrats in the country will move to assure that their wealth will be protected by the state. That will be the determining factor on who will be in charge in this country. The left is almost a non-entity in this struggle. This is a fight between the families and their factions within the military and police. The institutions have almost been rendered useless. Brian, the things one hears ranges from the Veep not being entirely sure he wants the job, to the pros not being convinced they think he can handle the job, to the Veep having popularity but no machinery of any kind or entrenched official support which would leave him isolated and vulnerable even if he were to get the job. Free market capitalism is no more… The advanced economies are already socializing risks involved in their financial institutions to forestall economic collapse. Here we are dithering on the conflicts between familial interests. We have been socializing the loses while the entrenched families continue to grow rich and fat off the people. How can we have an effective state in a country still dominated by fiefdoms? The foreign interests always watch with glee while we continue to fight over what little of the spoils they allow us. will history repeat itself (for the nth time)? surely we are in exiting times. pagpalain nawa ng Panginoon ang Pilipinas. sila sila na naman uli? basta ako, i am constant in my prayer to heavens to keep the first couple busy in nursing their diarrhea. ahh, the prize of eating too much from what they can take. from day 1 as veep, Gloria is already groomed to be snatching the post from erap. unlike Noli’s status today where we do not even see where he stands. Vulnerable from what? You mean we’re not really a democracy so that being voted into office isn’t enough but that one must have “machinery” to exercise one’s duty as voted official? Now tat is a revolution. BrianB, well, to start with, the infighting in the bureaucracy that occupies a lot of any chief executive’s time. if you don’t even have a big enough group to staff all the crucial appointments (executive secretary, pms head, appointments secetary, dbm secretary, etc.) you have to farm it out to allies and they immediately establish turf from which to narrow your options as president. Noli can have the option to retain the performing ones? at kung nag resign voluntarily ang cabinet,etc. di mamili sya sa career officials. Yan nga ang mga inaangal ng mga career officials eh,palagi na lang silang di napapnsin at nakikita ng search committee. “MANILA, Philippines–A resolution extending the term of President Gloria Macapagal-Arroyo beyond 2010 has quietly found its way into the powerful House committee on constitutional amendments. The resolution filed by administration Rep. Herminaldo Mandanas of Batangas seeks to keep Ms Arroyo in her post for one more year should his parallel proposal of moving the May 2010 elections a year later is adopted. Nahiya pa sila. Gawin na nilang 100 years. ikaw naman supremo, our congressmen have manners. ……..if they make this sacrifice, i will join the dance. and they should make the separation of church and state very explicit. Somehow, having catholic prayers before cabinet meetings and senate meetins is SO WRONG. dagdag pang isang taon, sapat na panahon na para aprub ang chacha. gloria forever na talaga. yan na nga ba ang sinasabi ng marami (except ung mga kaalyado ng mga suwapang at buwaya). kunwari 1 yr ang extension, tapos magiging forever na. hayuk talaga! Makes me change my mind in voting for anybody at all. But wait there’s more. Why does Gloria’s tactics remind me so much of Machiavelli or even Stalin? Too true there. The Church is actually one of their sources of votes, so what they say, is what they follow. Besides majority of the officials appear pious without having any piety or compassion for that matter for the Filipino People. so another year of gloria is ‘nothing’ to justice scalia? the same gloria who said she would not run but did, buying orchid fertilisers along the way to give to rice farmers? pero, ‘wag ka, hawaiianguy, ang iba rito sa blog ni manolo, ay naku, abot-tenga ang ngiti, para ng nakalulon ng buong manok, heheh. ang mga ka-alyado ni gloria kumikilos para patagalin ng husto ang pag-upo niya sa kapangyarihan. may katwiran naman na gawin nila iyon dahil sila naman ang nakikinabang ng husto sa mga grasyang ipinamu-mudbod na galing sa pawis ng taong-bayan. tayo rito, lalo sa mga kagaya ko, hindi naman tayo kapamilya ng mga linta na nagpapasasa sa dugo ng ating mga kababayan. kung hindi kami magsasalita at kikilos, eh, di tuloy na ang mga gustong mangyari ni gloria at mga alipores niya. kaya malayo na ‘much ado over nothing’ ang bagay na ito. kung ikaw pinili mong manood lang, ok lang iyon, karapatan mo naman, at sigurado ako na may dahilan ka kung bakit ganun ka. umiiyak ako dahil ang karamihan sa ating mga kababayan ay galit kay gloria. naku manuel, hindi ito magugustuhan ni maam. eh official book yan ni maam ha, john. alam mo Bert, yung pagkilos ng mga kaalyado ni gloria, pwede mong ihalintulad sa pagro-roar ng isang lion na naka-chains at nakakulong sa isang napakatibay na mga rehas at binabantayan ng maraming naka M-16 fully armed at round-the-clock ang bantay. ano ka ba? resolusyon pa lang yun! kahit sinong kongresista, pwedeng magsubmit ng resolution. balewala yang ginagawa sa House kung walang similar movement sa Senado. kaya talagang much ado about nothing. tularan mo si Fr. Bernas. kung sabagay, karapatan mo ang mag-remain na paranoid. dapat ko ring ipaglaban yang karapatan mong maging paranoid! maybe the filipino people should take up kengkoygresman garcia on his comparing gma to Jesus. nail gma literally on the cross and crown her with thorns! then we can find out if she will rise from the dead after three days! anyway, gma already claimed she was chosen by God to lead this nation! and her bishops can pray to high heavens! then we could truly claim to the world we are God’s chosen people not the Israel. can somebody please explain to me how the impeachment process really works. i am a bit confused, because it’s nothing like the impeachment process of clinton ( aside from the fact that republicans dominated the congress while gma’s allies dominated the phil. congress). mukhang di magkatugma ang interpretasyon ng mga oposisyon at ng mga tongressmen. siguro naman may mga lawyer naman dito na hindi bias sa interprtasyon nila. ito na lang. napakasimple – recall how erap was impeached. Art. 11 sec. 4 of the constitution was followed. the impeachment complaint filed with the House was signed by a little over 1/3 of House members then. kaya it was transmitted right away to the Senate. impossible at that time, considering erap also controlled the House. the signing took time, piecemeal approach. but when the 1/3 was achieved, the complaint was filed right away. back to the present – ang diskarte ng mga anti gloria kasi, file one complaint lang. Justice committee deliberates and rules on it, then the plenary affirms the committee vote. ako na mismo ang nagre-remind dito – follow how erap was impeached. eh for whatever reason, pinipilit pa rin yung diskarte na did not work since 2005.
of course erap style impeachment requires hard work. the 1/3 required must be lobbied, one by one. how come the anti erap forces then were united and cohesive, moving in one direction, almost naturally? how come the anti gloria school is everything but those? scalia, so it has nothing to do with presenting of facts or recital of facts? just getting the numbers? thanks for the enlightenment my friend. i wonder what the constitution’s 1/3 vote requirement for impeachment is for? the bright boys of the ‘united opposition’ have been repeatedly advised since 2005 – IMPEACHMENT IS A NUMBERS GAME! SECURE THE 1/3 VOTE IN THE PLENARY OR GET THE 1/3 BEFOREHAND! AGAIN! FOR THE NTH TIME! – RECALL HOW ERAP WAS IMPEACHED! THEY GOT THE 1/3! DON’T YOU GET IT? 1/3 OF THE PLENARY OR 1/3 OF THE HOUSE MEMBERS! THE COMMITTEE VOTE IS NOTHING! ay ewan ko ba sa inyo. bahala na kayo sa buhay nyo. scalia, my friend, sino ba ang nagpapadala sa emosyon? i just stated what i thought you meant. no spin, no twisting, nothing at all. i even thanked you. it seems to me you’re having some difficulty taking a complement. anyway, thank you again. with the tone of your most recent posts? scalia, my friend, tsk tsk tsk, now look who’s paranoid? is it just me? …accept defeat and move on! If the Congress junked the recent impeachment complaint against PGMA, NOT TO WORRY. We all know that the IMPEACHMENT is a POLITICAL PROCESS with pseudo RULES ON EVIDENCE. HOW INDEPENDENT THE SUPREME COURT WILL REMAIN??? Its numbers when its on the floor of the House. The 1/3 clause is actually ingenious because it allows even an Opposition not in command of the HoR to push an impeachment despite the lack of numbers. As the Erap Impeachment showed, it CAN be (and WAS) done. Facts matter when the real trial happens in the Senate. The Impeachment Trial of 2000 – 2001 showed that, too. And how brazen-ness can cost even the most secure, as evidenced by the way the Second Envelope was massacred. TAO dancing on the wounded body of our decency and Constitution ON NATIONWIDE TELEVISION had a very… provocative effect. But then, you have to get it to the Senate first. And to do that you need numbers, and a Speaker willing and… creative enough to get it past the Majority. rob, wasn’t it as much to JEE depriving congressmen of their prok barrel or proposing to reduce the pork barrel?